30 minute loaded quinoa taco salad is a satisfying all-in-one meal that holds up great for make-ahead weekday lunches. Vegan-friendly, gluten-free, and a total flavor fiesta. We’re gearing up for another snow storm here in Denver today, so I’m hunkered down with a laundry list of computer work to keep me occupied. I’m so grateful to have the luxury of working from home on days like this, because this Florida girl is still adapting to single digit temps and that white powdery stuff. And lucky for me, I have leftover taco salad to keep me from dialing up the nearest Thai takeout joint for pho. At least until dinner time rolls around. 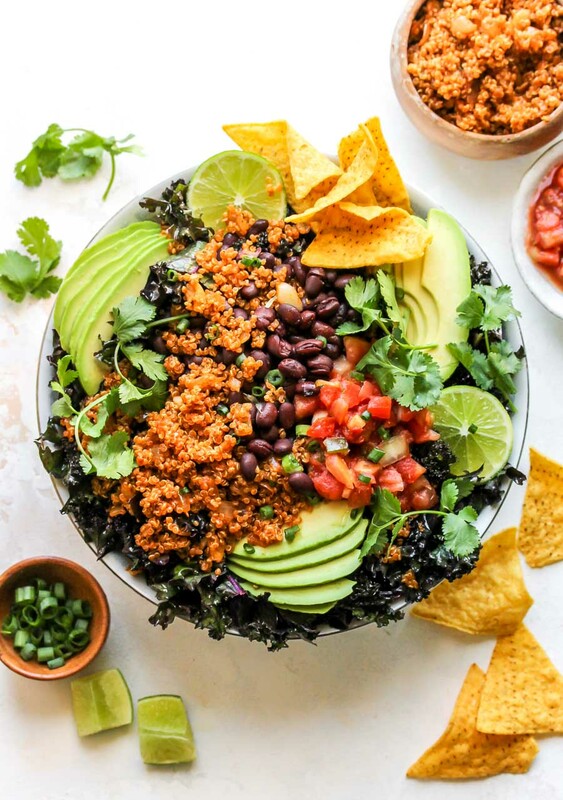 😉 If you’re looking for a hearty, vegetarian taco salad that you can stretch out for several days of lunches, this recipe covers all bases. 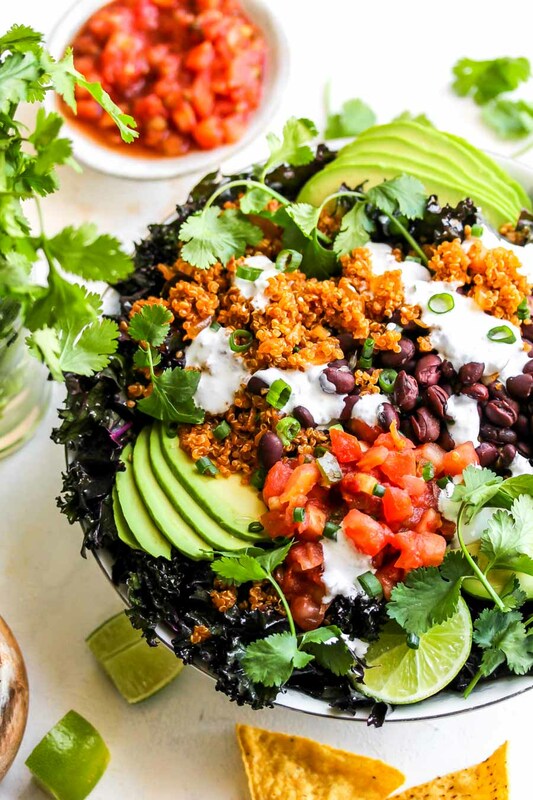 Nutrient and fiber-dense quinoa, black beans, and plenty of bright, colorful toppers lend a wholesome upgrade with a fresher finish than the classic Tex-Mex favorite. Using kale as the base helps this salad stand up to being made 2 to 3 days in advance, but if you’re not a fan of the sturdy green, you could use chopped romaine instead and just wait to dress it until right before serving. 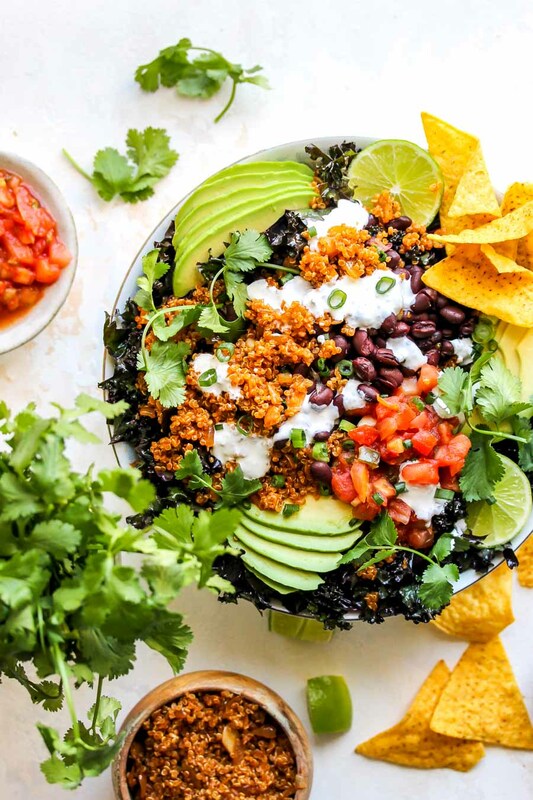 Chipotle-flavored quinoa and black beans make it plenty hearty, while fresh salsa, avocado, and cilantro lend some bright pops of color and crunch. Refrigerated pico and salsa are not only convenient and quick, but also flavor-packed. With an authentic and flavorful edge, this taco salad soars above the rest in its simplicity and speed. Try it this week and be sure to tag #dishingouthealth on Instagram so I can see your beautiful creations! Cheers, friends. 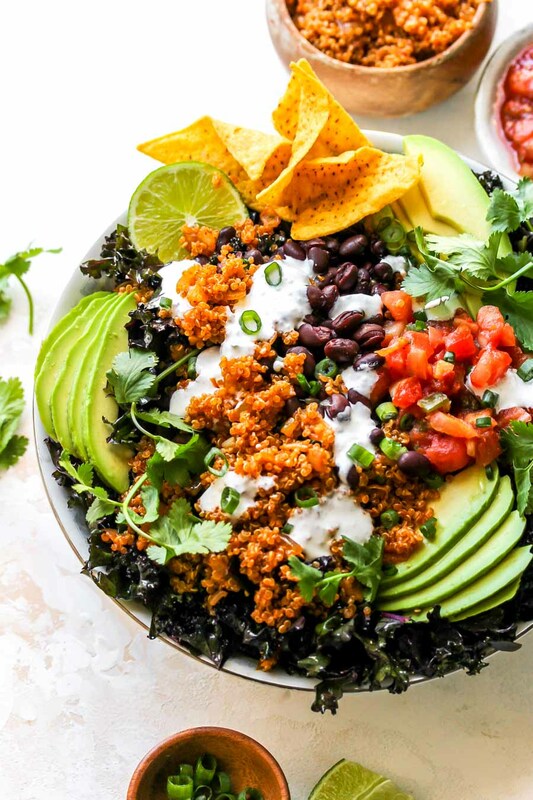 30 minute loaded quinoa taco salad is a satisfying all-in-one meal that holds up great for make-ahead weekday lunches. Vegan-friendly, gluten-free, and a total flavor fiesta. Heat 1 Tbsp. of the oil in a medium saucepan over medium heat. Add onions and garlic; cook until onion is softened, about 5 minutes. Stir in adobe sauce, chili powder, and ½ tsp. of the cumin; cook 1 minute, stirring often. Add quinoa and vegetable broth; increase heat and bring mixture to a simmer. Cover, reduce heat to low, and cook until quinoa is tender and liquid has been absorbed, about 15 minutes. Transfer to a wide bowl or plate and refrigerate while you assemble remaining salad ingredients. Prepare dressing by combining remaining 2 Tbsp. olive oil, ¼ tsp. ground cumin, 1 Tbsp. of the lime juice, and salt; stir with a whisk. Place kale in a large bowl and add dressing. Use your hands to massage dressing into kale for 1 to 2 minutes until leaves starts to soften. Top kale with black beans, pico (or salsa), avocado slices, and cilantro leaves. Stir remaining 1 Tbsp. lime juice into yogurt (or sour cream). Whisk in up to 3 tsp. water to thin out to desired consistency. Top salad with cooled quinoa mixture and drizzle yogurt dressing overtop. Hi Susan, that’s fantastic to hear! So glad you enjoyed. Hi! I think you meant “adobo” vs “adobe” yes? Making this for sure though! I’ve been looking for a recipe to replace taco meat and I think I found it!